At the end of your turn, if you have a creature with 5 power or more, Awakened Dreamer gains +1/+1. Awakened Dreamer is a rare Agility creature card. It is part of the Houses of Morrowind expansion. "We see you waking and sleeping." This card's ability applies the Reverie card effect. 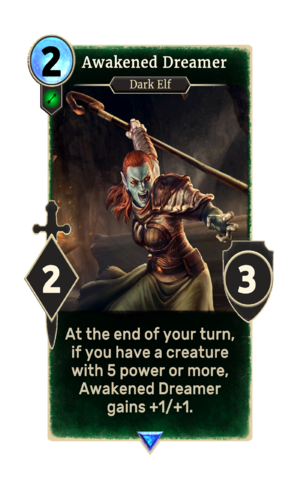 This card appears to depict Zula, who appeared in Morrowind as a dreamer found in the Sixth House stronghold of Mamaea. This page was last modified on 2 March 2019, at 00:17.